A course designed by the American Red Cross to prepare youth with the training every parent wants in a babysitter: safety, basic child care, safe play, first aid and critical emergency skills, and professional leadership and care-giving skills. Each session is divided into two four and one-half hour classes and are held at the Y Express. Participants must complete both days of the session they register for to receive certification. Financial aid available. NOTE: CPR/1st Aid and AED certifications are now good for 2 years. Be prepared to respond to emergency situations, learn the basics of wound care, bleeding control, bandaging, recognizing the signs of a heart attack, how to provide care for an infant, child or adult who stops breathing, is choking, or whose heart stops beating, and more. 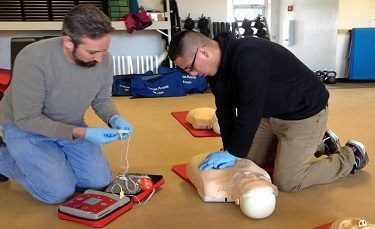 All instructors have been trained and certified by the American Red Cross.